The Israel Robotics Association (IROB), representing the Israeli robotics community, and RoboValley announce a long term collaboration focussing on joint research, education and tech transfer. 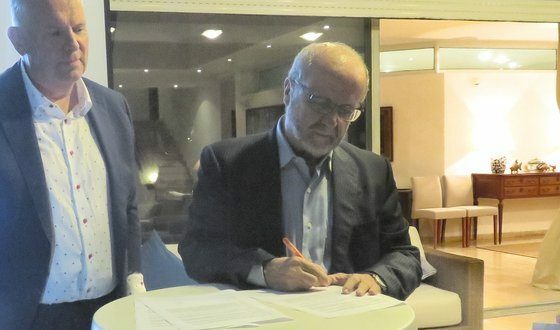 Arie van den Ende (RoboValley) and Zvi Shiller, chairman of the Israeli Robotics Association, signed a Memorandum of Understanding at the Netherlands Embassy in Tel Aviv last week. The signing of the letter of intent represents the success of the first Dutch robotics trade mission, which took place last week (www.gamechanginginrobotics.nl). A delegation of businesses, academics and entrepreneurs visited Ben-Gurion University of the Negev, Technion and they were present at the International Digital Life Design Innovation Festival in Tel Aviv with the ‘Holland Robotics Pavilion’. The trade mission was organised by the Dutch embassy in Israel and RoboValley in close collaboration with the Netherlands Enterprise Agency. "The Dutch can learn from the Israeli start-up culture, which is an example for the rest of the world"